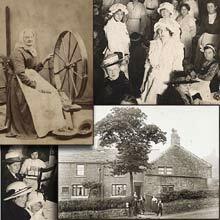 "My Aunt Louisa Brierley (fondly known as 'Louie'), husband Jack and daughter Monica, were regular visitors to our house in Oldham. Uncle Jack and my Dad Bill Keary were first Cousins. Their history went back a good number of years. 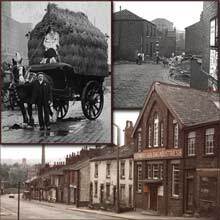 'The Brierleys', as they were collectively known, would travel up to Oldham from Liverpool at Bank Holidays or at any time when the family planned a Celebration party. I particularly remember parties held during and following the 2nd World War. Parties were usually held at my childhood home in Goddard Street, Oldham. A Cellar / Air Raid Shelter had been created within the foundations of the house. A shelter furnished with bunk beds, sleeping bags, and cupboards containing an emergency supply of tinned food. The Cellar also became the scene of the party during the Air Raids of 1940/41 etc. For weeks prior to the party, precious supplies of tinned food saved from the rations, would be stored away. Somehow or other, a barrel of beer was obtained and when delivered approximately a week prior to the party, it would be placed on a special stillage at the top of the Cellar steps. lt was my job to see the beer was kept cool e.g. a supply of damp towels must cover the barrel and be renewed on a regular basis. On the night of the party 'The family', i.e. Kearys, Suttons and Brierleys would gather together dressed in their best clothes. few drinks, then Monica would take over the piano, my Uncle Norman Parsons produced a small drum kit, my Dad (Bill Keary), produced a banjo, and Jack Brierley played a washboard. The house (and the neighbours) rocked with the noise. The Songs, sung by the 'boys' of the Sutton family, were 'Nellie Dean', 'Old Bull and Bush', 'Bill Bailey', 'Mamee' etc.etc. At some point, Auntie Louie Brierley would disappear upstairs for a short time then return dressed as a Gypsy. For the next hour she would sit in a corner of the Cellar and if you had a cup of tea with her, she would read your fortune from the tea leaves left in the cup. The music continued upstairs. It was only by chance the 'Alert' siren was heard and Bill Keary and Norman Parsons would have to get kitted out in their uniforms as Air Raid Police and leave the party to join their colleagues at Headquarters. Meanwhile, at Goddard Street, the party continued. Early the next morning as the party drew to a close, all the family would get together and sing what became known to them all as the 'Suttons' Family Anthem', a very old song called 'Lullaby Land'."